These days, the education of our children is driven by statistics and standardized testing rather than by observation of our children and their actual learning needs. 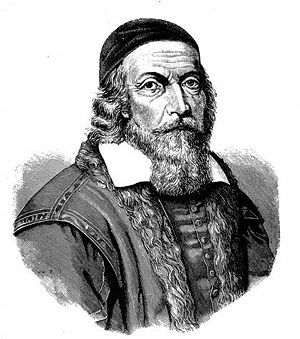 But for interesting reading we can go back to John Amos Comenius, the father of modern pedagogy. The Great Didactic, edited by M.W. Keatinge can be found on Google books, Here. If you were to go to any modern education university, you would learn far more about testing than about the arts and Comenius' proposed use of the arts in education. Today in the Clear Spring wood shop, the upper primary students will be finishing their treasure boxes, and the high school students will be turning wooden bowls. We are expecting a major winter storm beginning later in the day, so I have errands to run, firewood to put in place, and a host of additional duties in addition to classes. Please take the poll at right. Give some thought as to how you best learn. Are we different from our children in how we learn? Do you think, based on how you, yourself may learn that our present schools are what our children most need? In other words, we have our schools backwards. The arts and crafts should come first and be central to our educational model. And as Chris notes in the comment below, fat chance of that happening anytime soon. Make, fix and create. Working with you in your work shop may be the only chance your children and grandchildren ever have to discover the hands-on creation of self. 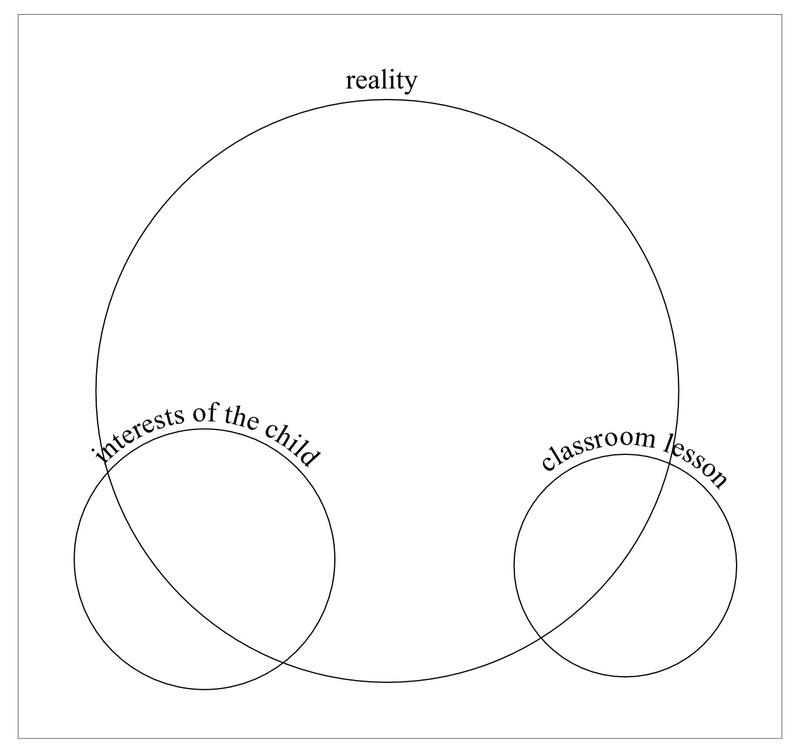 In educational sloyd, one of the guiding principles was to start with the interests of the child, then to move from the known to the unknown, from the easy to the more difficult, from the simple to more complex, from the concrete to the abstract in increments that nourished the continuing and expanding interests of the child. In an ideal world, children would come to the classroom with high expectations for themselves, racing to engage in the lessons offered. They would see the relevance of everything they learn as being to their competitive advantage. But schools just haven't worked out that way. My illustration above may be helpful in reminding that spheres of interest do not always coincide. There are structural changes that can be made in education to bring the child's interests and classroom lessons into intersection. So what can be done? First, take the kid out of the classroom for lessons that engage all the senses. Next, bring components of real life into the classroom to expand engagement of the senses. 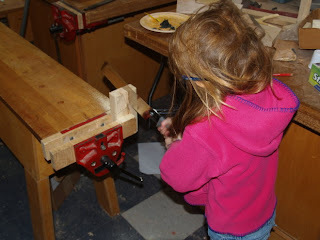 Third, engage the children in making things with real tools and materials. All senses are required for that. And finally, be prepared to assist the student in pursuing interests beyond the school walls through real world engagement in travel and internships. I want to thank those who are taking part in the poll at right. It appears so far that for many, learning is a multi-sensory experience. The following is from The Education of Man by Friedrich Froebel, writing on the senses. The debasing illusion that man works, produces, creates only in order to preserve his body in order to secure food, clothing, and shelter, may have to be endured, but should not be diffused and propagated. Primarily and in truth, man works only that his spiritual, divine essence many assume outward form, and that thus he may be enabled to recognize his own spiritual, divine nature and the innermost being of God. The young, growing human being should, therefore, be trained early for outer work, for creative and productive activity. For this there exists a double reason an inner and an outer requirement; and the former, inasmuch as it includes the latter, is of the greatest importance and eternal. The requirement is supported, too, by the nature of man as such. The activity of the senses and limbs of the infant is the first germ, the first bodily activity, the bud, the first formative impulse; play, building modeling are the first tender blossoms of youth; and this is the period when man is to be prepared for future industry, diligence, and productive activity. Every child, boy and youth, whatever his condition or position in life should devote daily at least one or two hours to some serious activity in the production of some definite external piece of work. Lessons through and by work, through and from life, are by far the most impressive and intelligible, and the most continuously and intensely progressive both in themselves and in their effect on the learner. Notwithstanding this, children--mankind, indeed--are at present too much and too variously concerned with aimless and purposeless pursuits, and too little with work. In other words, Make, fix, create. In the blog, I have frequently talked about multiple intelligences theory, that we human beings are smart in a variety of ways beyond what are currently expressed in schooling. Learning styles also vary among individuals, and there are a variety of theories to describe the ways in which we learn. One of the most common theories of learning style breaks us down as being primarily "auditory, visual, or kinesthetic and tactile learners." In other words, the lecture format is the least effective means to offer learning opportunities, and yet is the primary means through which secondary and University educations are presented. The interesting thing is that the wood shop actually presents the strengths of all three. You see, you hear AND you do. Hands-on learning encompasses all three predominant learning styles and it doesn't take extensive research to understand what you can test for yourself and observe in your own life. John Grossbohlin sent this link to an article in the Wall Street Journal on the failure of colleges and universities to impart critical thinking skills. Doonesbury had a cartoon last week in which the professor explained to his university students how much they (or their parents) were paying for each to sit through his lecture while they were distracted by twitter and checking Facebook on their hand-held digital devices instead of paying attention in class. Do you think that students would better develop critical thinking skills if they were actually doing something about real learning? If only 20-30 percent of university students are auditory learners it seems like parents would want to ask for more than their money's worth from their children's educations. Knowing what schooling is, they might at least wonder what their children are doing there in the first place, or demand that real learning take place. Some children and parents will be saddled with massive debt for the time spent Facebooking and all a-twitter in lecture halls throughout the US. What kind of learner are YOU? Answer the survey in the column at right. Make, fix create, and share a better understanding of hands-on learning with those in your life. 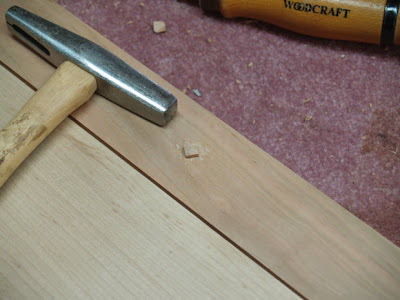 The photo above shows the assembly of dovetails forming the corners of the maple Krenov inspired cabinet also shown at left. "...the variety of occupations which enter into the-making of the box constantly refreshes this interest after it has once been started. The wood must be sawed to line. 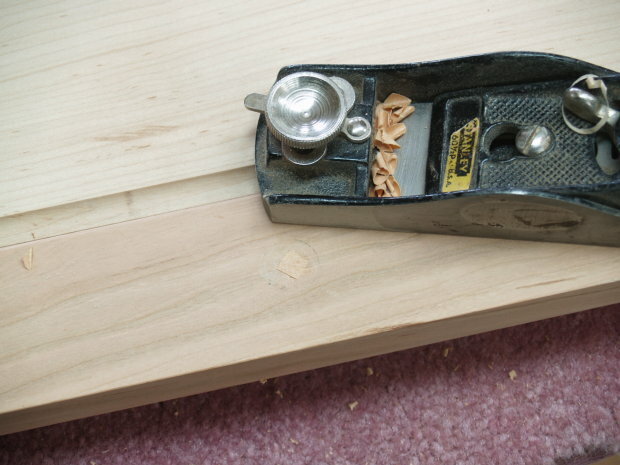 The boards must be carefully planed and smoothed. The joints must be accurately worked out and fitted. The lid must be attached with hinges. The box must be painted or varnished. Here is a sequence of means leading to an end, a series of operations all pointing to a final object to be gained, to be created. Again, each of these means becomes in turn and for the time being a secondary end; and the pupil thus learns, in an elementary way, the lesson of subordinating minor ends to a major end. And, when finally the task is done, when the box stands before the boy's eyes a complete whole, a serviceable thing, sightly to the eyes, well adapted to its uses, with what a glow of triumph does he contemplate his work!" Generally in schooling students are expected to perform series of seemingly unrelated exercises leading to total abstraction. When a person works on something real, he or she breaks the operations down into manageable sub assemblies, each in concrete form with concrete objectives toward a singular end. This is what is meant by "will." And it is a quality that can be applied to everything a man or woman does throughout a long life of learning. Can you see how working on related things toward a single concrete purpose might offer children some pedagogical advantages over what they currently get in American education? The photo at left shows another part of the puzzle that will become a Krenov inspired cabinet. Before final assembly, the legs will be shaped so they are angled on the front and thinner toward the bottom. 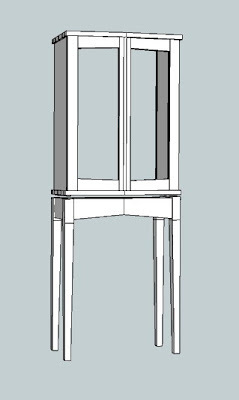 The cabinet base will be attached to the stretchers connecting the legs. 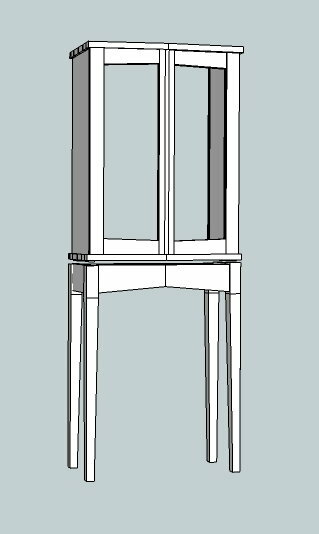 In the photo below, I've begun installation of the knife hinges in the top and bottom of the cabinet in preparation for assembly. Mario, in a comment below asked how pieces in the photo at the top fit together. That is one of those things that most of us would need a picture for. Educators not knowing how wood shop fits the general educational needs of children have to be shown. Make, fix, create. One of the biggest problems in school improvement is poverty. Working parents often leave children alone in the after school hours, where they have access to unrestricted television, but no tools and no Grandfather's wood shop to visit and find personal inspiration. Being poor in America used to provide the opportunity to see tools and people at work. One of the largest predictors of school success is the success of parents. If we compare poverty rates in the US (20%) with that of Finland (5%), we can account for the dramatic difference in PISA scores and perhaps look no further. If we were to end poverty in America, we would see better schools as a result. But we have never accepted a national will for that. Instead, many would prefer to see people rise up on their own efforts, and are willing to accept children living in poverty as a reasonable price to pay for their idealism. But our success as a nation is truly dependent on the success of all. We must provide the means and incentives for parents and children to better their own lives. From my perspective that means wood shop, for all students, in all schools. For children in poverty to be entertained and distracted by television and thus stripped of their creative power is a formula for national failure and international disgrace when we could actually do so much better. An important pilot program is taking place at North Bennet Street School in Boston. I had visited NBSS in 2001, and first learned about Educational Sloyd from their development director. 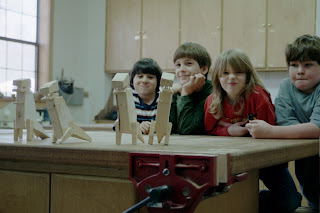 I did research and wrote articles about educational sloyd, reminding North Bennet Street School and woodworkers across the US of their role in the establishment of woodworking programs in public schools. In 1883, students from neighboring Eliot School began visiting NBSS for 2 hours a week and that led to the adoption of woodworking education for all students in the Boston Public School system. That system of woodworking education served as a model for the introduction of woodworking education in cities throughout the US. And what we are witnessing now is the return of woodworking education. I am pleased that I had a role to play in that, through my work at Clear Spring School and as a mentor for North Bennet St. School as its renewed its relationship with Eliot School after a 125 year lapse. I don't know how many woodworkers in the US can fully grasp the significance of this. But significant it is. This morning, I am writing a letter of support for the director of North Bennet Street School for a grant application they are submitting to a major foundation. Please cross your fingers and wish all our children the best of luck. First Boston and then the world. 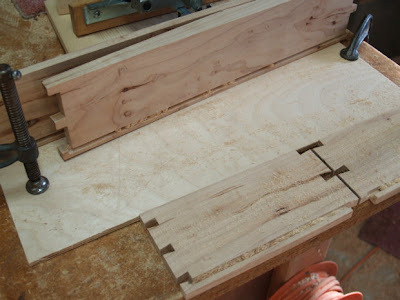 As you can see in the photo above, I have been hand-cutting dovetails for the drawer to fit the maple cabinet I'm making. I have learned that cutting the pins first actually gives a more accurate fit, so after doing it the other way for years, I am now convinced. Pins first and then tails. You can witness the precise fit. We have to break out of our old ways if we are willing to allow change. Turn off the TV set and Make, fix, create. Set an example for your own children to follow. Last night I watched the American President's State of the Union address and the Republican and Tea-party responses. The following is from Felix Adler, 1888, in his explanation of the value of manual training. "I wish to add a few words touching the influence of manual training on character in general, and its importance for children of all classes of society. I need not here speak of the value of manual training to the artisan class. That has been amply demonstrated of late by the many technical and art schools which the leading manufacturing nations of Europe have established and are establishing. I need not speak of the value of manual training to the future surgeon, dentist, scientist, and to all those who require deftness of hand in the pursuit of their vocations. But I do wish to speak of the value of manual training to the future lawyer and clergyman and to all those who will perhaps never be called upon to labor with their hands. Precisely because they will not labor with their hands is manual training so important for them--in the interest of an all-round culture--in order that they may not be entirely crippled on one side of their nature. The Greek legend says that the giant Antæus was invincible so long as his feet were planted on the solid earth. We need to have a care that our civilization shall remain planted on solid earth. There is a danger lest it may be developed too much into the air--that we may become too much separated from those primal sources of strength from which mankind has always drawn its vitality." Adler had begun his remarks with an investigation in how manual training can help a child develop will. Manual training is also connected to the development of national will. Leaving potential business leaders, lawyers, and those who would run our political institutions untrained in hands-on creative activities, has left them crippled in perspective, leading to a lack of will for the things that would have given our nation its greatest strength. How can they wisely invest in that of which they know nothing? In the state of the union addresses last night, one side sees a role of the American government in fostering economic growth and the other is abhorrent toward that notion. The out of touch politicians in Washington will fight over their airy ideological perspectives until the cows come home while the American people become further crippled by a lack of national will. Take the future in your hands. Make, fix, create. DIY, TIY. The hands are engaged in every facet of human reality. If you touch something in your home, it is something that has been shaped consciously or unconsciously by human touch, and thus the hands themselves are an invitation to contemplation, prayerful meditation if you will. This morning, I seem to have little to say, as I have been particularly watchful of my hands. Even now, as I type this entry to the blog, I am paying greater attention than normal to the movements of each finger. As I rest and read what I've written, my hand are held in my lap, fingers entwined, and I notice. I am not always able to do this. In my normal reality, I forget my hands. They fade into the background of cognition. As I do ten thousand things with them each day, my thoughts are swirling inside my head where one gets to make up stuff to suit one's fancy. But the hands themselves are the level of consciousness in which water is carried, wood chopped, and vital service is performed that transforms human reality. The work of the hands may be done without notice. Just as the hand on the stair rail leaves its polish and patina over time without intent, the hands have done their work. But what if we are to truly transform our educational systems from one of fanciful distraction to one of concrete service, realistic engagement, and a deep, rich unfolding of higher consciousness? Will that come from paying attention to our hands or by avoiding, neglecting, denying them entirely as we have done? I explained to my turning students yesterday that success on the lathe is not measured in how fast you turn, but how successful you can be at slowing down. The attention required can be excruciating at first if you are unused to using your hands and mind in such ways. Skill is like that. Anaxagoras, one of the first Greek philosophers, and the one who first described the concept of mind, also noted that man is the wisest of all animals because he has hands. And so it is, that if we each are to become wise, it will be through the closest of attentions to our own hands. Do so. Pay attention. Make, fix, create. 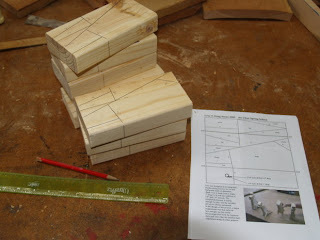 Today in the CSS wood shop, I'll be helping the 7th and 8th grade students to begin making travel journals, and work with the 9th grade class in wood turning. "It is virtually impossible to become proficient at a mental task without extensive practice. If you repeat the same task again and again, it will eventually become automatic. Your brain will literally change so that you can complete the task without thinking about it." According to the Time magazine article, "once this happens, the brain has made mental space for higher-order operations..." Does any of that remind you of your hands? 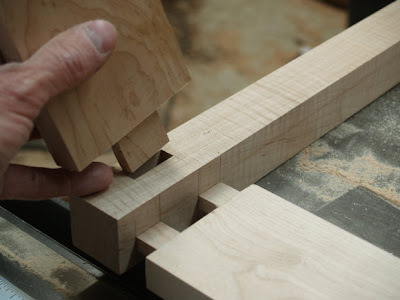 After school today, I cut mortise and tenon joints to connect the legs and stretchers for my Krenov inspired cabinet, as shown above. I have a busy day with 4 classes and I'm a bit nervous as to how it will go, introducing some new things and keeping some students turning bowls on the lathe, which is always a bit scary until I get them in the groove. I know you all are also busy, and so I thank you all for taking my interests seriously. I am thinking back to a few years ago, when research was announced that drew a connection between math performance and instrumental music. The side of that that most people seemed to get was that music and math are connected. Music is mysterious and math for some is also mysterious, and so at a first glance, we would naturally jump to the conclusion that the research proved the connection between music and math, which I for one would never doubt. But there is something more in it, and that is the word "instrumental" which implies the use of musical instruments, which further implies the use of the hands. The hands are generally ignored, because in their most cognitively efficient use, they have to be. And so people would not look at that research and say "My God, it's the hands!" Which is what might happen if you have a "hand centric" view of reality as do those of us who are concerned with the Wisdom of the Hands. So one of the things one might do to expand the dialog, and bring the hands into further consideration in research would be to expand the range of tools considered and the types of people utilized in the research, drawing a connection between the performance of instrumental music and the cutting with a chisel of a dovetail joint, making a series of precise bends with pliers, knitting a scarf, or doing an intricate braid. I am reminded of being at the seaside market in Helsinki and watching a woman knit gloves. It is something that could be performed inside an MRI machine with non metallic needles and might offer research possibilities further illustrating the role of the hands in development of intellect. The early research on music and math made people think, "We need to have music in school." You can see how far that got us. But an understanding of the hands would make a person think, "We need to have the hands in schooling." Which offers a much more fundamental all inclusive shift in education. The hands need to form the cutting edge of all learning in order for it to be most effective and valuable to all students. For as Jacob Bronowski said, "The hands are the cutting edge of the mind." I hope you all have some time to think about all this. Can some of the existing body of research on music be replicated using common creative tools employed by craftsmen to better illustrate that it is not just the music that makes the man, but the HANDS that make the music AND make the man? In the photo at left, you can see legs for a small cabinet being marked for mortises to be cut. It is important that each leg be carefully marked even though the mortiser setup including stop blocks will be responsible for the accuracy of the process. It is very easy to get confused when the machine is running and you get into the pattern of cutting one after the other. will someone explain it to me? Can someone explain this to me? It is from a course taught by Professor Stuart Firestein, Neuro-biologist at Columbia University on the subject of Ignorance. 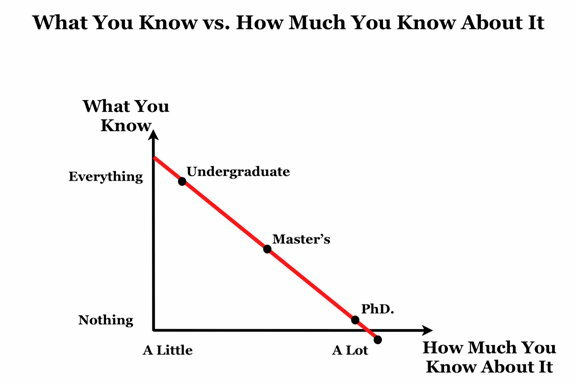 It appears to propose that as you advance in education, you know more and more about nothing, and less about everything. Does this explain the idea of a pinhead? Wouldn't the world be a better place if we could engage it as the mystery it really is? With open minds? Perhaps that is the point Firestein is trying to make. The following is from Felix Adler's address to the National Conference of Charities and Correction, Buffalo, July 1888, and while it is lengthy, it describes a component of education that is ignored by most in American education. 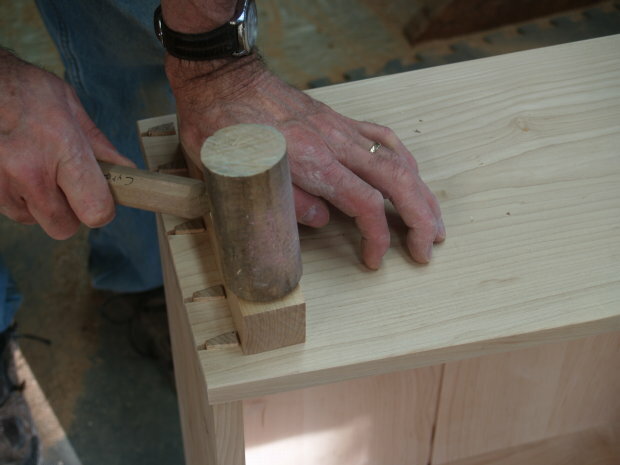 As a box maker, I appreciate that Adler uses the making of a box as his example to describe how will is developed. "All that has been said thus far converges upon the point that has been in view from the beginning—the importance of manual training as an element in disciplining the will. Manual training fulfills the conditions I have just alluded to. It is interesting to the young, as history, geography, and arithmetic often are not. Precisely those pupils who take the least interest or show the least aptitude for literary study are often the most proficient in the workshop and the modeling-room. Nature has not left these neglected children without beautiful compensations. If they are deficient in intellectual power, they are all the more capable of being developed on their active side. Thus, manual training fulfills the one essential condition—it is interesting. It also fulfills the second. In Time magazine this week, the lead article is about "Tiger Moms" who literally drive (and drive) their children toward Mom's idea of success. What Adler is talking about is the development of internal rather than external motivation that emerges from the gradual unfolding of will. 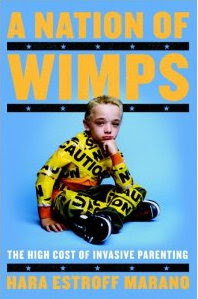 The following is from the article on "tiger moms:"
"In the 2008 book A Nation of Wimps, author Hara Estroff Marano, editor-at-large of Psychology Today magazine, marshals evidence that shows [tiger moms are] correct. "Research demonstrates that children who are protected from grappling with difficult tasks don't develop what psychologists call 'mastery experiences,' " Marano explains. "Kids who have this well-earned sense of mastery are more optimistic and decisive; they've learned that they're capable of overcoming adversity and achieving goals." Children who have never had to test their abilities, says Marano, grow into "emotionally brittle" young adults who are more vulnerable to anxiety and depression." In other words describing the absence of will. As our schools have cut funding for the arts, AND wood shop, our children in schools have only two remaining areas in which to seek, demonstrate and acquire mastery. Reading and math. You do it in schools and attempt to demonstrate it through test scores. Can you see how we've become a nation of ignorant pinheads? (Definition of a pinhead... someone whose area of expertise can be confined to the head of a pin.) And all this in a time when our children should be learning that learning is without bounds. Instead, Make, fix, create. DIY, and since the schools won't teach it to your kids, TIY. Today was a great day in the wood shop. 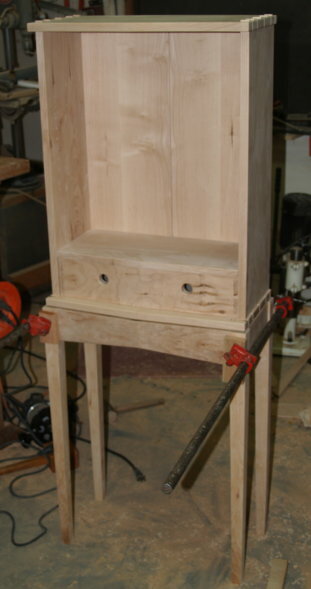 I am making a small maple cabinet on legs of a style similar to what James Krenov made sort of popular. 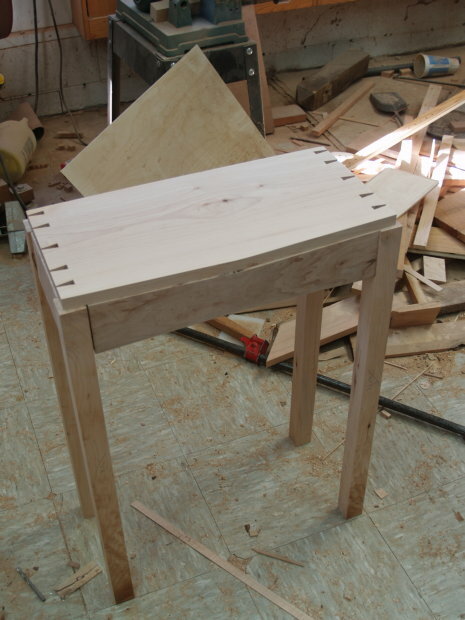 Simple work with hand tools, it is not, but I did cut the dovetails by hand. It has been said by some that one should choose one's profession so as never to need to go to work. That's what woodworking is for me, and I know others share the same sentiments. When I am in the right frame of mind, things fall into place. And so it is with every profession. Our real work is on our own relationship to the universe at large, and to feel in opposition one's own profession is a sad situation that makes work feel like work. On the Krenov inspired cabinet, I decided to use only hardwoods, no plywood back, and so to allow for the expansion and contraction that takes place over a nearly 20 inch width, I designed the back in two floating panels which intersect at the center with a simple tongue and groove joint. Cutting that joint is what you see in the photo above. 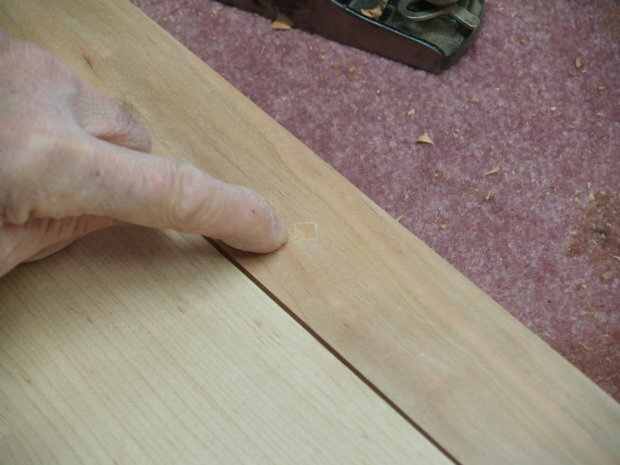 In the photo below, I routed the groove in the cabinet sides for the two part panel to fit. Earlier in the day I worked on the frame and panel doors. 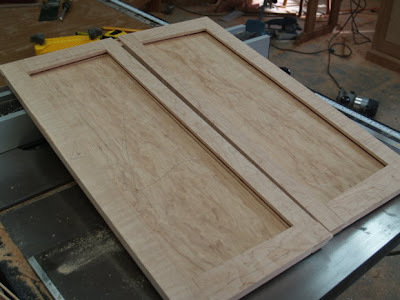 At this point, shown in the photo, the panels are formed to fit in grooves cut in the door stiles and rails. After sanding and shaping the inside edges, the doors will be ready for assembly. If you look closely you may see that the door panels are not rectangular, as the door rails narrow toward the center of the cabinet. 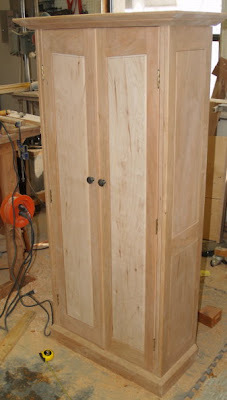 At left you can see what the finished cabinet will sort of look like. Fine Woodworking editor, Matt Kenney said that he is going to post a link to the Boston Globe article in which I was quoted. 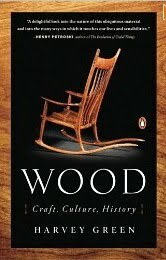 He said that "the demise of shop classes is a favorite subject among readers of Fine Woodworking." But the whole problem with American education is far larger that just the loss of wood shop. The demise of wood shop is actually a symptom of much larger problems at the very core of education. In the drive for greater efficiency and cost savings, we've given up on hands-on learning, and as a consequence, we have the least cost effective educational system on the planet. We spend more and get less because we have forgotten how human beings of all ages learn best, hands-on. And so if we have become a nation of idiots and pinheads, we have at least earned it dishonestly and not by conscious intent. As federal pressure intensifies to ensure students graduate ready for college and careers, researchers are beginning to go beyond identifying the subject-matter classes students need to succeed after high school and home in on the cognitive and non-cognitive skills that also contribute to success. I suspect that if we throw enough experts at the problem, and they study the problem in the usual manner, they still won't know what some of us know from the experience in our own hands. We learn more by doing, and by doing we also learn being. To shape wood is also to shape self. And it doesn't just happen in wood shop, but also in music class, in art class, on the athletic field and in the science laboratory. Where the hands are engaged, real learning follows, and that form of real learning is not just short term in the head, but in the depths of character as well. Craftsmanship is more than just something you know in your head and hands. It is a caring response to all that matters, and is thus a framework for positive engagement in life and life-long learning. "That is all very well. I like your factories and your wealth; but tell me, do they turn out men down your way?" And Adler asks, "Is this civilization of ours turning out men--manly men and womanly women?" Those are the values of character that come from hands-on learning that our schools neglect and that our children so desperately need. Do you think those experts looking for "non-cognitive qualities of success" will know where to look for them or how to create opportunities for them in our nation's schools? Make, fix, create. *When asked about Adler's quote of the "aging poet," Walt Whitman said, "I guess that's me: and it is very kindly and friendly, isn't it?" In either case, it is good to know how to fix things. I had installed the door knobs on my latest cabinet, and then decided that they were too high. My decision had been based on where they fit my hand, but when I saw them on the cabinet, I regretted my decision. So how to fix? in the series of photos below, you can see. 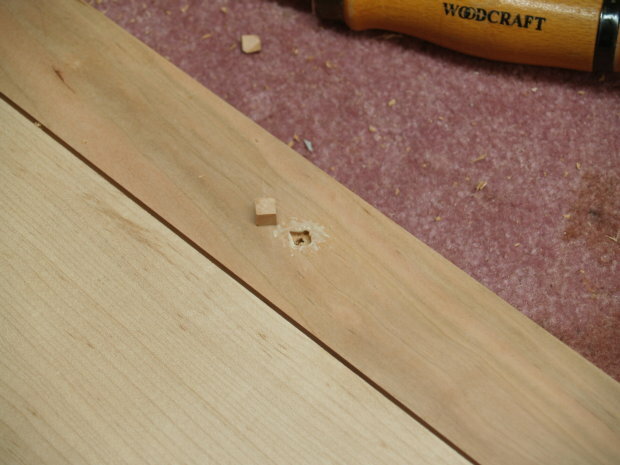 Use a square chisel from a mortiser to cut a square hole surrounding the hole drilled for the knob to fit. Cut a block of wood to fill the hole after it has been chiseled out with a straight chisel. Glue the block of wood in place and use a block plane to plane it down to the surrounding stock. Without my finger pointing toward the fix, you would likely never know it was there. Compare the photo at left to the image shown yesterday to see the results of my fix. Compare and contrast. Was my fix worth the few minutes of head scratching and labor? Or did you like it better in the first place? John Deal has reminded me of Susan Goldin-Meadow's work on gesture and I have mentioned it several times before in the blog. Use the keyword gesture in the search block at upper left. The point, I am reminded, is that the failure to engage the hands in American education is not for the lack of evidence, but for the lack of leadership and motivation. I thus regard it as but a matter of time, and a matter of your help. Make, fix, create. One of the ideas I've expressed many times in this blog has been that as one develops skill, the cognitive burden of a task decreases. When you first tackle an operation, or learn a new tool useage, a great deal of conscious attention is required. For example how do I hold the tool, this way or that? After, some practice, questions have been answered. 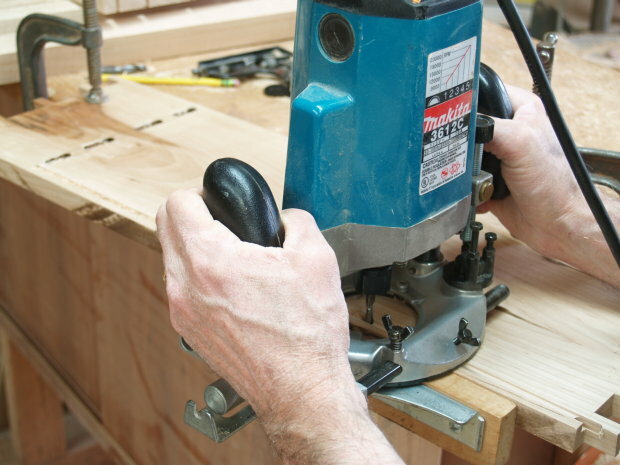 The right posture is automatically adopted, the grip on the tools feels natural to the operation. This brain research, Cortical activations in primary and secondary motor areas for complex bimanual movements in professional pianists, by researchers Jäncke L, Shah NJ, Peters M. shows that as a pianist's training advances, his or her hands perform with with fewer brain cells being required for the task. In essence, the research describes and illustrates the reduction in cognitive burden as skills are developed in the hands. The results suggest that the long lasting extensive hand skill training of the pianists leads to greater efficiency which is reflected in a smaller number of active neurons needed to perform given finger movements. This in turn enlarges the possible control capacity for a wide range of movements because more movements, or more 'degrees of freedom', are controllable. In other words, when we develop hand skills, not only are we able to perform those skills with less attention, more processing power is made available for the advancement of further skills. We wonder how so many wonderful things were accomplished by our human predecessors without the mechanical processes we have now. And perhaps at least the start of the answer lies here. When writing by hand, the movements involved leave an imprint in the part of the brain called the sensorimotor. This process helps to help us recognise letters. Simply touching and typing on a keyboard produces a different response in the brain, which means it does not strengthen the learning mechanism in the same way. I know that some of my readers are interested in research showing the linkage between the brain and the hands and one specific area of research that holds promise is neurological research on music. About the only musical instrument that is not played by hand is the human voice, so it can be reasonably suggested that any research concerning performance may offer insight. If any of my readers want to dig in, you can find a database of neurological music research at the University of North Carolina, Greensboro, created by a former doctoral student, Richard Edwards. Dig in, and let Me know what YOU find. EDWARDS, RICHARD D., The Neurosciences and Music Education: An Online Database of Brain Imaging Neuromusical Research (2008). Directed by Dr. Donald A. Hodges. 162 pp. Music Bird. You will be able to log on to the site as "guest" and no password is required. It may not be a jackpot yet, but may help us to move WOH in the right direction. My thanks to John Deal for helping me make the connection. There is no distinct line between tools and instruments. 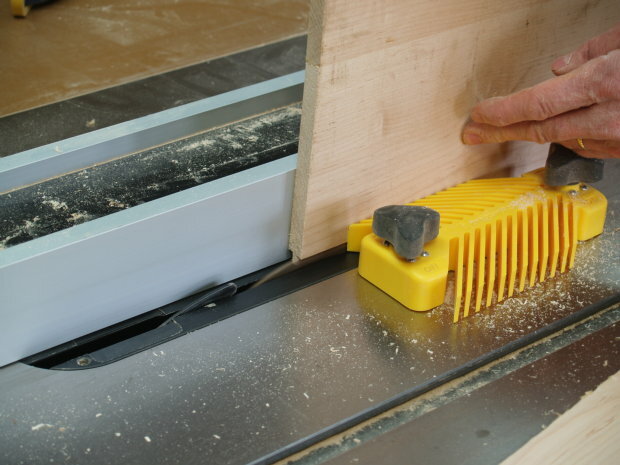 In fact you can play music on a saw, or just engage in its rhythm as you cut wood. I have hopes that some of this will help us to offer greater evidence as to why children need to be creative in schooling and why they need to be deeply engaged and expressive through their hands. I am reminded of an experience in my wood shop about 30 years ago. Even the voice can become connected to creative woodworking through tool use. I was working on a large project and hired a friend to help. He was a musician and had a great deal of experience and training in voice performance. As he was sanding with a random orbit sander, I heard exquisite harmonies coming from the room where he was at work. I stopped in and listened as he sang in perfect pitch in perfect harmony and rhythm to the sounds and modulations of the sander. On that occasion, we renamed the Porter Cable Speed Block sander "Roy Orbitalsand," and so it was called until its dying day. Musical intelligence is not all that far from what we do in the woodshop. Make, fix, create. 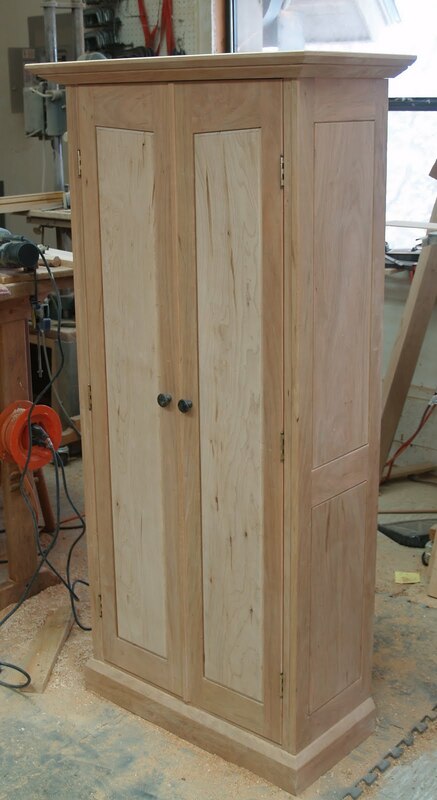 My cherry jelly cabinet is nearly complete as you can see in the photo above.If you want to know more about the relationship between musical intelligence and wood shop, I have written about it before in the blog. Type in key words, like music or rhythm. "Are our lives any “easier” today? I doubt it. We’ve simply replaced physical struggle with mental anxiety. And I would argue that a lot of that anxiety occurs because we are not satisfying that innate need to be manually and creatively occupied. Art, Craft and Manual Production satisfy that need on every level." Make, fix, create. Become whole. My school is canceled today due to snow. Not a whole lot of snow yet, but enough to make driving conditions hazardous, and it is still falling and will be throughout the day. As you may know, my hand-centric view (as contrasted with the normal brain-centric view) of nearly everything keeps me thinking and I want to state things as clearly and accurately as possible. The subject often dominates my lucid dreaming state, but then I awaken disappointed that I can't state things as clearly as I had dreamed them. The hands and brain co-evolved simultaneously as a completely integrated behavioral and developmental system. I had it better in my lucid state, and this draws heavily on Hand author Frank Wilson for inspiration. Also in the news is an article that claims that Americans are missing crucial critical thinking skills... like those you might acquire in wood shop. 45% Of Students Don't Learn Much In College Can it be that those wanting teachers to carry guns had missed out on development of some important critical thinking skills? Back when manual training was first started in American schools (Calvin Woodward at Washington University and John Runkle at MIT) the idea was that by neglecting children's hands-on learning of physical reality, schools left students impaired in critical thinking and reasoning skills. Wood shop was their proposed fix. The idea was that by providing a firm foundation through the making of real things with real, tangible, physical materials, and real tools, constructive engagement in real reality would result. Students would become better engineers, better doctors, and better scientists as a result of working with their hands in real tools-based manipulation of real materials. We crapped out on wood shops and other hands-on learning over the last 20 years and what we see is the result. 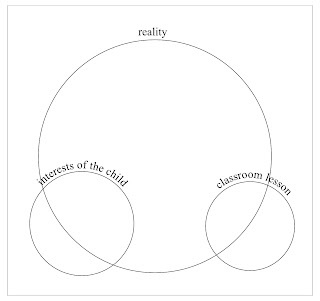 I have been reading Vandewalker's The Kindergarten in American Education, 1923. The Kindergarten movement in American schools brought music, dance, the arts, an interest in manual training, bright colors, gardening, potted plants, an interest in nature as a foundation for science, and all the beautifying elements to American classrooms. You can look at the standardized testing movement and watch all that evaporate before our eyes. First we make schools inhumane, neglecting children's creative power, then we propose putting real firepower in the hands of their teachers for the coup de grâce on American education. Can you see why some of us have serious concerns that we have become a nation of idiots and pinheads? Make, fix, create. This morning as I was checking with the lower primary teacher concerning today's wood shop, Lilly came up to me during recess to show me her math work. Can you imagine children working on their math at recess? It is not unusual at Clear Spring School for children to take such a strong interest in their work. Today in the wood shop we began working on dinosaurs, and Steven and Oakley felt compelled to tell me that wood shop is their favorite class. Working with such wonderful children is a great reward, and I wish more people had the opportunity to experience it for themselves. And of course, I wish that every school was like Clear Spring School, where even teachers can have so much fun. 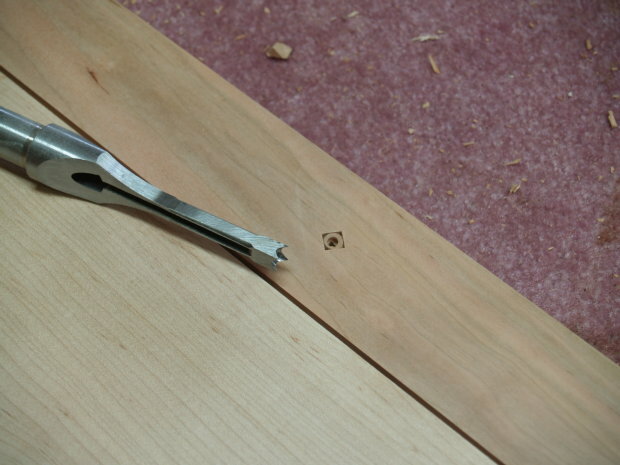 To begin this project, I mark out pieces of 2 x 4 7 inches long and number the cuts. 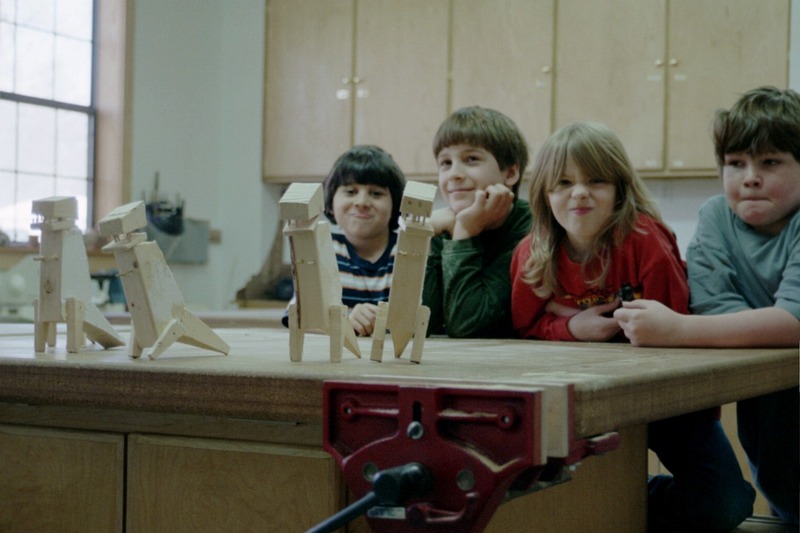 The children make the set of cuts, a few pieces are discarded as scrap and the remaining parts assemble into a t-rex. The kids want to finish in one day, but the project is too challenging for that. Chang Type Industrial Co. Ltd., a manufacturing company based in Taiwan, has agreed to purchase the Delta brand of woodworking equipment and machinery from Stanley Black & Decker and is moving its operations to South Carolina. 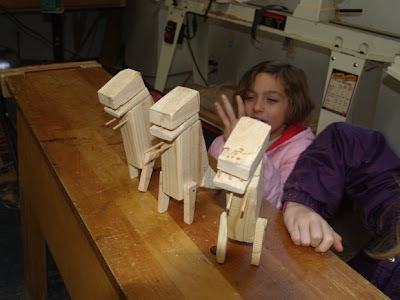 Tomorrow in the Clear Spring School wood shop, the 1st, 2nd and 3rd grade students will make t-rex dinosaur models like those featured in my article in Fine Woodworking's website. Make a T-rex model figure. There is a link in the article which will allow you to download free plans. Have fun. DIY, TIY! Make, fix, create. Today two high school students were shot by accident in a Los Angeles hand gun incident. The handgun had been taken to school loaded and discharged when the student dropped his backpack down on his desk. The automatic handgun fired a single round into the temple of a young woman and through a young man's neck. Do you think that is what the Supreme Court would call a "Well ordered militia?" Do you think an introduction to creative tools and skill in their use could help to displace the fascination some children seem to have with guns? Also today in South Carolina a 14 year old boy killed his father and great aunt before calling the police and offering his surrender. He also shot his grandmother. She is hospitalized in critical condition. The rifle used had been his birthday present from his father. Do you think that's what our founding fathers had in mind? Do you think the father and great aunt would be dead if the father had given his son some woodworking tools for his birthday instead? As an alternative to gun violence we might consider helping our children in their alignment with creativity. 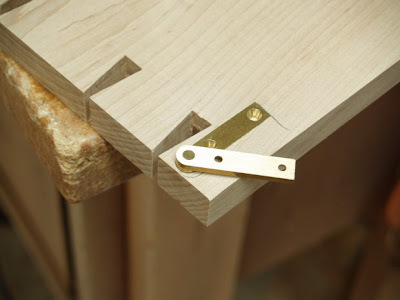 Woodwork Joints, How They are Set Out, How Made and How Used. I'm not sure how many of my readers are taking advantage of the Gutenberg Project. Many of the wonderful books in the public domain about our subject area have been discarded by libraries, snapped up by collectors and have become hard to find. An example is Woodwork Joints, How They are Set Out, How Made and How Used, by William Fairham. 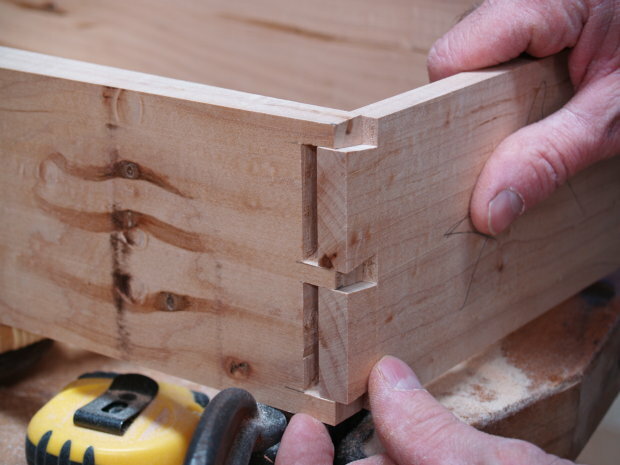 It is well illustrated and contains some very practical hands-on advice about how to cut a variety of woodworking joints. At gutenberg.org, search for woodwork, manual arts and other subjects for some interesting reading including G. Stanley Hall's opinions on Sloyd. It is good to see a Republican with courage and common sense. Richard Lugar, Republican Senator from Indiana suggests that renewing the ban an assault weapons would be a good idea. He's not running for re-election so has the opportunity to be honest. Which makes me wonder, is Jared Lee Loughner the Supreme Court's idea of a "well regulated militia?" Put real creative tools in kids hands. Make, fix, create. DIY, TIY. The schools won't do it for our kids, so we take matters in our own hands. Today in the woodshop, the 7th and 9th grade students began bowl turning on the lathe. is an intelligently written piece on the nature of crafts, sent to me by Mark Thomson, director of the Institute of Back Yard Studies, occasional WOH blog reader and Blokes in Sheds author from down under. coke, pepsi and the innermost meaning of things. 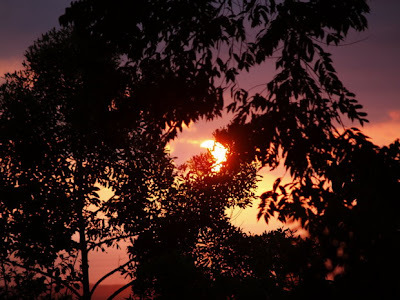 One of the things that became apparent in our visit to Costa Rica was that people of all social classes can live in such close proximity to nature. Everywhere we went, front doors were open and as we drove by, we could see right inside. Along the road through Portalón there were small houses only a few feet from the road and alongside the river. If you were driving by at the right time, you could see mothers cooking and tending their kitchen fires. Our lodging at Portasól consisted of two bedrooms, a spacious kitchen, two baths, and a large porch that served as both outdoor dining room, and outdoor living room. Our dinners were at sunset, and our breakfasts out of doors in the fresh morning air. Wherever we went, people were walking, riding bikes, carrying babies or machetes. And so we saw a simple life in close proximity to the natural world that too many in the northern hemisphere ignore. Howard Gardner had identified an intelligence that some have called "nature smart." And it seems Costa Rica got its share, and we, who have the shameful distinction of leading the world in energy use per capita got the short end of the nature intelligence stick. If you're not exposed to nature long enough to develop some intelligence of it, you may never know what you missed, but the rest of the world will as you pass through it and lay waste. One morning we waited in our rented Toyota for a large family to load into a small 1970's era Datsun sedan. The car had been cared for and painted red with spray cans. Two older women and about 4 children of various sizes from teens to toddlers crawled in with the driver along with a large cloth bag of some produce they were taking to market. It is a life different from ours. And it is of great value to be introduced to things outside our normal realm. Our house at Portasól was a bit unnerving in that it was open to the outside world at all times. There were doors and windows that you could close, but the gables in each room were screened and open to fresh air. So we slept with the sounds of the jungle, the cacophony of rain, the screeches and whirrings of birds and animals in the the night. In the early evening as the light would fade, the bats would begin their silent flight. We could see them only a meter or less away as they whirled in at the edges of our light. I am thinking of research that would explore our human relationships with tangible objects, that would measure brain response using MRI imagery. Years ago, they did research measuring MRI response to Pepsi and Coke, and were able to watch as portions of the brain "lit up" in response to the taste of one or the other. As far as I know, no similar research has been done or is being done on the hands. It would be easy to have a battery of small objects that correlated with a values inquiry questionnaire would offer insight into our relationship with objects, and thus offer insight into the close relationship between hand and mind. I had studied sociology and political science in college and while I've had better things to do over the past years, it would be interesting to put my full life experience to some use. It seems that most research and science these days is inspired by cerebral centrism, when a hand-centric point of view would offer new value and a fresh insight. For my nature smart readers I have attached a photo that you might want to identify. Use the comments to make your guess or prove your smarts. Today Clear Spring School is closed for Martin Luther King day, so I will be busy preparing for classes later in the week. We had driven nearly all day with the first 3 hours of driving through intense fog. 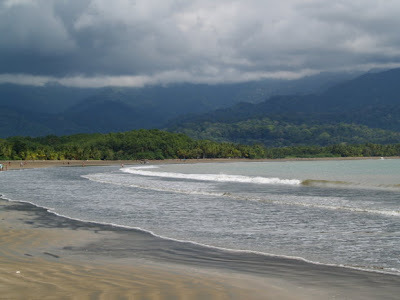 We stopped at the Super Market in Quepos to buy groceries, visited Manuel Antonio by mistake and had to back track and get on hwy 34 for the last part of our journey. We arrived at the very small town of Portalón just as the sun was setting in the western sky. We bumped slowly over round stones in a rough road that wandered along Rio Portalón. The river rumbled over massive boulders on the left. An old man came slowly forward on his bike, rolling left then right and back as he found his bumpy way slowly along the narrow road. He concentrated to keep his tire on the smoothest path between the larger stones. We stopped to allow him to pass. Concerned that we were lost, I rolled down the window, and asked, "¿dónde está Portasól?" He stopped and backed up slightly. I had awakened him from a road that required as much intense concentration as our own. I repeated my question in poorly remembered Spanish and I wasn't sure that he understood. He gestured with his head back in the direction from which he'd come to inform us that we had nearly arrived. We continued at our slow pace over the rough road, crossed a narrow single-lane bridge with a small waterfall at right. Going further we were almost relieved to find ourselves at a guardhouse with gate. The sign said Portasól, but the gate was closed. We tried to explain ourselves to the guards in English and what little remained from my 9th grade Spanish class, and were finally led by ATV up to our temporary home overlooking the Pacific at a distance and the Costa Rican jungle close at hand on 4 sides. Carlos hit the switches on the lights, and we awakened to the contradictions and contrasts of 21st century Costa Rica. I am not sure how to explain all this, but I know that by writing about it, some may become clear. So, instead of dwelling exclusively on the mess we have made of American education, culture and economy, I want to share more pleasant things over the next few days. I wondered each day as we drove slowly down our road, about the lives of the people we passed. Surely there were stories there. And each day, as we traveled that very bumpy road, we took in what we could without making nuisances of ourselves. Are there some great Spanish writers who have explored the paces of village life? The photo above is what we had just missed by arriving late. We did not miss sunset again during our stay in Portasól. 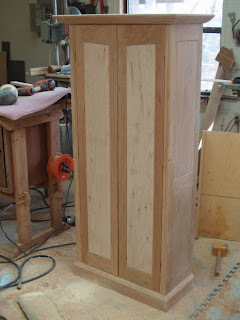 The photo at left shows the nearly completed jelly cabinet made of cherry and maple. A bit more sanding, drilling of the holes for shelf supports, and it will be ready to hang the doors and apply Danish oil. It seems that violence involving guns is inescapable, but then that was the purpose for which they were made. On the day before the shooting in Arizona, there had been a school shooting in Omaha, Nebraska, in which a troubled young man shot and wounded the principal, shot and killed the vice-principal, and then took his own life. The gun lobby will insist that there were other factors at play. In this case, the father is a police officer, and the weapon used was his service revolver. The dark fantasies that surround firearms lead to their use in that which they were created for. Children with tools have other things to live for and work towards. I learned about the school shooting in a conversation with my sister who teaches in Lincoln, Nebraska public schools. She also told me about one of her students who had taken a class in decorating cakes. A new sense of self esteem and creative purpose literally changed every aspect of his life. Can we not see that regardless of how one feels about guns and gun legislation and availability, the lack of creative tools in the hands of children is the far greater problem? Years ago, when I was a professional potter, Ceramics Monthly published an article about a Czechoslovakian potter who was using a 38 caliber pistol in the creation of sculptural forms. He acquired the pistol from the police for temporary use and would take blocks of clay in a plastic state, and blast holes through as a movie camera captured still images in serial progression. A 38 caliber police pistol for shaping clay is similar to using a back hoe to clean your teeth. It provides interesting effects, that may not of been of any real value. When potters finish their work, they fire it in a kiln, but in this case the firing came first and nothing remained of value except the movie images of the bullet passing through the splatter and mist of porcelain clay. At the time, I was a serious potter and did not see the value of a 38 in my own studio... I was working toward more delicate effects that expressed skill. I am kind of stuck in my mind on the relationship between tools and weaponry, swords and plowshares, and exploring the fascination our culture has with guns because I think it helps to explain a few things about the hands. I also believe that if we were trained in the use of tools, we would have a safer, saner and more creative culture, with less attraction to guns and gun violence. In a sense, the Czechoslovakian potter's work could be seen as a reaction to artistic and cultural repression. Unlike our situation in the US where he could get his tool for $40.00 from a thirteen year old drug dealer in Detroit, he had to borrow it from the police and return it when his blasting was complete. There are striking similarities between a well crafted tool and a well crafted gun. They are each appealing to the hand. 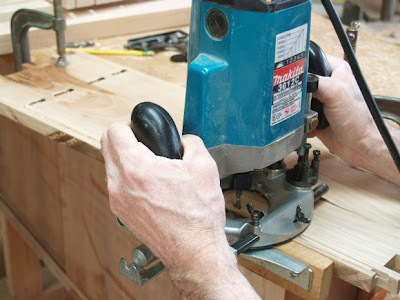 I have an interesting tool on my desk made by Bridge City Tool works, and although I haven't quite figured how to use it effectively in my work, I love the feel of it, its weight and how well it is crafted. Its working qualities cannot help but impress the mind, the eye and the hand. There are many of the same qualities available to the hand, in holding and handling a fine pistol or knife. Human beings crave these tactile engagements. Our hands and attentions are captured by them. To have a pistol in your hand tells of a position of power. It can be put to destructive use without any long ritual of training or developed skill. 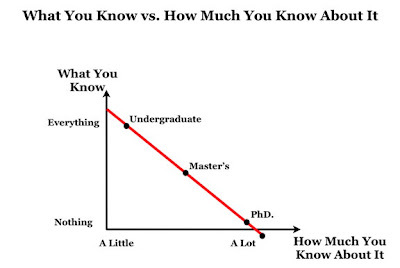 And yes, I do know that many practice to develop skill, but also know that most do not. Tools on the other hand, offer the same tactile qualities. A fine Lie Nielsen plane offers the same level of craftsmanship one might find in a Glock. And so it is time to compare and contrast. Both engage the hand. With a foundation of acquired skill the plane engages the imagination calling to mind things that can be created. The Glock, even with no skill, pushes the mind toward things that can be destroyed. A 38 fired into a block of porcelain leaves but a splatter and mist of that which was there before. Anything else you want to see in that state? You can do it and not undo it with what you hold in your hand. All across the US, children have been educated in the tools of destruction. They participate endless hours in computer gaming in which their real fingers pull virtual triggers and their eyes, minds and hearts are compelled toward insensitivity to violence. Our politics tell them that holding and using real weaponry is their right. And on the other hand, our children are isolated from the tools that offer skilled creative engagement in their communities. The urgings of our hands are to engage one or the other. Our minds and imaginations take their cue from what we hold in our hands. The power to create or the power to destroy. I would prefer that our children have saws and hammers in hand, learn things that allow for the development of skill and community rather than tragedy and remorse. That we don't work toward skilled tool use in our nation's schools is a matter of my deepest concern. If what you saw happen in Arizona makes you sick as it does me, make, fix, create and make certain that every child in your own community has the same opportunity to develop skill in the use of real tools. "No one I'm talking to is defending the status quo. Everyone I talk to really shares my sense of urgency that we have to do better for our children. We're fighting for our country here." You can tell when someone is serious when they are willing to go hand to hand and I don't see that in what he and others say. Most politicians, out of cowardice, are busy TALKING and taking pot shots at education. When will people start to understand that guns and violence show no courage but are the antithesis of real bravery and should be scorned? Inability to resolve problems through reason and compassion should be burdened with shame. Need a gun to walk to the mall? Is that the world we want for ourselves or for our children? One Republican congressman thinks he should be allowed to carry a concealed weapon to Congress! What kind of cowardice is that? He should be called out for being such an ignorant, pathetic wuss, and should be ashamed of himself, but our gun loving, courage deprived culture applauds him for his foolishness. The congressman says he wants to protect others. Please forgive the sarcasm, but I can hear the song, Macho, Macho, Man playing in my head. In Arizona, one gun-wielding bystander rushed in ready to fire, only to realize at the very last second that he was prepared to shoot and kill the man who had wrestled the gun away from the shooter bare handed. What would our trigger happy gunman say to explain himself? Oops? Heroics. Aren't we proud? (Again, please excuse the sarcasm.) All too often the wrong people are killed through gun violence, and some conservative politicians have said that the problem with Arizona is that there were not enough guns. Can you see why I might be in a crappy mood today? I am tired of seeing such idiocy running loose and being given voice. Courageous men and women fight mano a mano, hand to hand and it is a tragedy that so few understand the transforming capacity of our human hands. When the hands are engaged, love of learning follows. When the hands are purposefully engaged in learning, intelligence and character arise within each child. We all know that we learn best when we learn hands-on but we still refuse to offer hands-on learning to our children in our schools. As a nation, we simply refuse to give the eduction we know is most effective and best. Arne Duncan mentioned "fighting for our country" and I would love to arm wrestle with him about this mano a mano. He may be young and scrawny, but my ideas are stout. He's got the weight of his official position. But the millions+ years of hand/brain system evolution is on my side. I'm not afraid of hand to hand. If any of my readers know the man, please extend my invitation. Most would like some new handy, dandy fresh out of the box gizmos to fix American education. There actually is a relatively simple and effective working formula for educational renewal and reform. Make, fix, create, and love of learning follows. Today in the wood shop, I'll be sanding, hinging doors and doing final assembly on my cherry jelly cabinet. Then this afternoon, I'll spend time in the kitchen making pizza. A small group of friends is invited. I plan to make "tipico" Costa Rican pizza, as only I can imagine it. In the meantime, a woman in Colorado was arrested for negligence in the death of her one year old son. She admitted she was "on Facebook playing Cafe World, checking on a friend's status and sharing videos in the living room," as her son drowned quietly in the bath tub. It calls to mind an earlier incident in South Korea in which a couple was charged in the starving death of their actual child while they were busy raising a virtual child online at an internet cafe. We have a perverse relationship with our computer products. They have a tendency to displace engagement in reality. Let's work our way back to real things. It's easy. Make, create, fix, nurture, tend and care. These are just a few shots in remembrance of the beauty and warmth of Costa Rica... 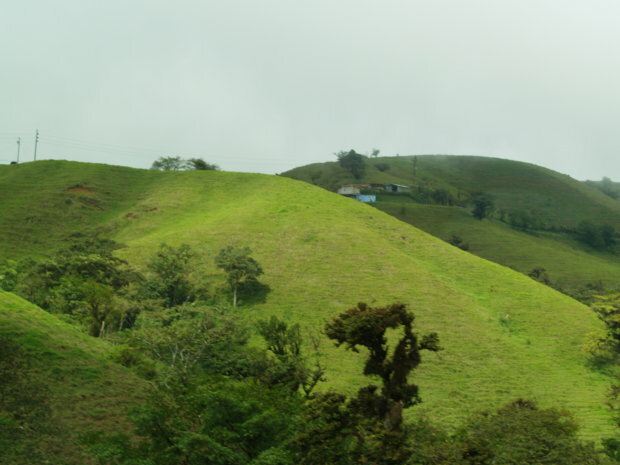 The patchwork of acreage is on the drive from San Ramon to La Fortuna. The photo at center is the volcano at Arenal emerging from the clouds. 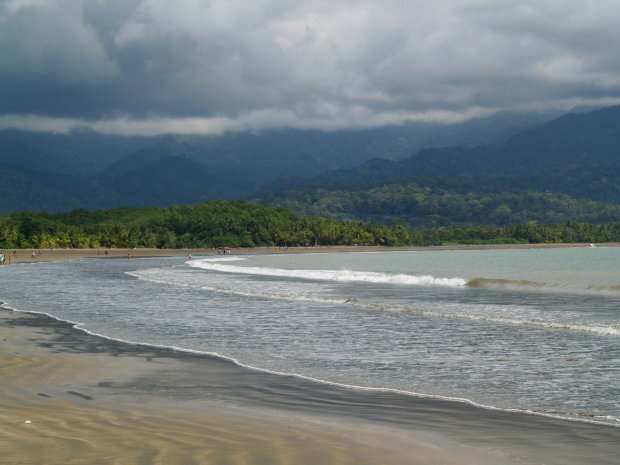 The beach below is Playa Uvita. Some of my readers may remember Stanley Kubrick's film, Full Metal Jacket about an infantryman pushed toward murder and suicide. We are given choices of how to engage physical reality, and as human beings, we are challenged to either align with the creator and exercise human creativity in physical reality, or we may find ourselves estranged and engaged in other ways tragic to others and ourselves. You may be troubled by the events in Arizona and hope to find some way to understand, as do I. There is a fine line between the power to create and the power to destroy. The movies are full of graphic illustrations from which we might learn from mistakes and misdirections. The full wooden jacket is concept I just made up this morning as I woke up from my dreams. 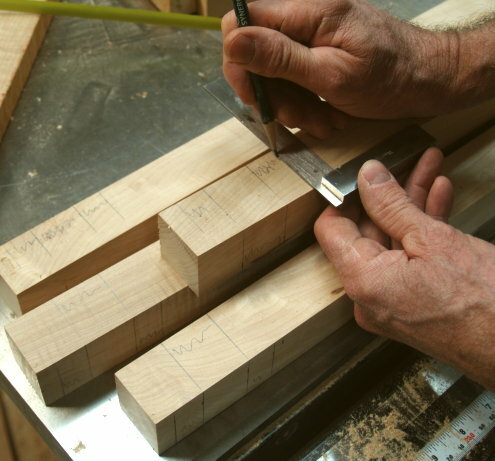 It's a way to describe what is offered by creative engagement in woodworking. There are challenges in woodworking. Wood doesn't always do what we we might hope or expect. We might even find ourselves talking to it. Wood talks back. As we shape or sand, it provides a dialog through tactile and visual changes from coarse to smooth. As it does so, it soothes, consoles, and opens our eyes (and every other sense) to beauty and our own creative potential. It provides armor and protection in that it allows us to feel engaged at our highest levels as positive forces within our families and communities. When a young man or woman becomes involved in making things from wood, he or she also engages in the remaking of self as craftsman. The values of craftsmanship are the essential values of civilization. We choose swords or ploughshares, one or the other. I am amazed when I teach woodworking, how many people tell me that they were drawn to woodworking for the solace it provides. They may have felt a lack of connection and needed some way of creative engagement in tactile, physical reality to feel most whole and most thoroughly alive. They come to class, not only to make boxes, but to reformulate and nourish themselves as caring craftsmen. Can you see what happens when we put children in situations in which their needs for creative expression are left unfulfilled? Watch the news. It is cold here in Arkansas, and it is something of a shock to be back from warm Costa Rica. We have been going through our photos and are reminded of a gentle, beautiful place. The photo was taken on the drive north to La Fortuna from San Ramon. Wherever you are, Make, fix, create. I am still processing my experience in Costa Rica, and I suspect I will be for some time. This is one of the birds I saw as we drove along the river at Portalón. 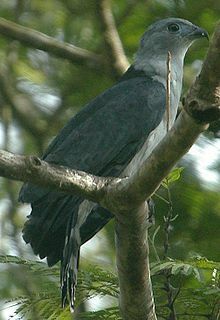 It is a gray-headed kite. John Grossbohlin sent a link to an article in the Wall Street Journal that will help us to explore some issues if you are even handed (meaning that there is some balance in your personal hand/brain/system functionality). Lynn Tilton is the unlikely hero of American manufacturing. Her firm Patriarch, named after her father, buys failing manufacturing firms (there are many of them) and builds them back up in value and competitiveness. She says,"The key to America's future is manufacturing." "We simply have to become a country that can make things again." When those in American education so tragically failed to understand the value of the manual arts to ALL students, thus isolating career and technical training from "college prep", they shot our nation in the foot. As described by Ms. Tilton, "If we don't become a country that makes things again, we won't have enough jobs for our people. Without jobs, we could have social unrest. And that's not science fiction." It should come as no surprise to anyone with common sense that people are drawn to invest in the things the think they understand (whether they actually do or not). It should take very few brain cells to understand that a woman from a working class background, who put herself through Columbia's business school, would understand the value of manufacturing as those educated solely in college preparatory programs and universities would not. So there are two things at play in the investment principle I just stated in the last paragraph. Because investment in the US has NOT been driven by an understanding of the values inherent in manufacturing, we've become crappy at it and drove it down the toilet, and then came up with all kinds of rationales to explain why we should abandon the American worker. Remember when we were told that we would be a "service economy?" When everyone realized that meant flipping burgers, they changed the name but left the mess. We would be an "information economy." Which meant we wouldn't really care about actually DOING diddly squat. Concurrently, because investment managers have had little insight into actual productivity, investment strategies have become driven by abstract market formulas, often unrelated to what happens on the ground. Thus investment has become riskier, less resilient, more speculative and less sustaining of long term economic success. By abandoning manual arts training in schools, first eliminating it for those going to college, and then taking it away entirely from nearly everyone else during the last generation, we have done a tremendous disservice to our nation's people, to the value of our economy, and to our culture. Lynn in the video above, describes "rebuilding with our own hands, what others have talked away." Those who are unacquainted with the serious, sincere, connection that the hands form with intellect, character, compassion and our essential humanity have pushed our nation to the brink. I am back from Costa Rica. It was warm there, it is cold here. Back to work! Burrr. We are leaving Costa Rica in the morning and returning to Arkansas. I am looking forward to getting back in my wood shop. Even though it will be very cold when we get back to Arkansas, a warm fire in the wood shop will make things just right. Did you know that the engagement of the hands is a primary means through which to sustain mental health? Ask any artist how they feel when they are engaged in their work. I can tell you from my own personal experience how it feels to be away from the shop for some time and then to feel a renewed rush of neurohormonal response. Some have called these "creative juices." And we have become idiots and psychopathic by neglecting hands on learning in our nation's schooling. Do you think I'm kidding? Gun violence in schools has risen in direct proportion to the decline in wood shop and the arts. And as I arrive back in he US from this peaceful haven, I come home with some anger seething. I am tired of living in a nation of idiots, and since I'm not going anywhere but home I vow my best efforts to make changes in our nation's schools. In the meantime, one of the public responses to the killings in Arizona has been a dramatic increase in Glock sales, as that particular brand of hand gun was used to kill 6 and injure a number of others including Congresswoman Giffords. Can someone please explain to me why that should not be considered a completely morbid response? As these new Glock owners hold their weapons, do they feel some perverse connection with the killer's horrific acts? If there is one thing worse than being a nation of idiots, it just may be that a nation of angry well armed idiots takes the cake. Make, fix, create. Real men don't need firearms to prove a point. Pura vida: It is difficult not to compare and contrast Costa Rica with Arkansas and with the USA. We have one more day of our stay here, and find the circumstances to be delightful. The people are happy, or seem outwardly so. They are friendly and helpful. While as some of my readers know I cannot help at times being deeply concerned about the direction of the American culture. No one would consider the Costa Rican people to be out of touch. They're busy making things, preparing food, tending gardens and fixing things. They care for their children. Every small town has its own small school, neatly kept. It is not uncommon to find old cars operating on the highways beyond their years. They are kept clean and in working condition well past the time in which Americans would abandon them to the heap. Yesterday’s events in Arizona, USA are disturbing. I have kept isolated from events in the US during the last week, and up until the shooting of an American congresswoman, I have done pretty well to put aside my deep concerns for the appalling quality of political discourse in the US. It is as though no one knows how to use their words in kindness, and too few know that words can incite those who are unstable to do horrendous things. I have hopes that all of this tragedy brings a renewed faith in reasonable dialog. I want to talk about a few things. The first is that the shooter in Arizona probably suffers from mental problems. That is an assumption on my part based on the idea that no one in his or her right mind would do such horrendous things. The second thing I want to address is that it seems very apparent that sick minds are often drawn to gun violence and yet we do absolutely nothing to keep guns and ammunition out of such dangerous hands. Our video games and television programs have given substance to the delusion that addressing problems through gun violence is natural to those who have reached some kind of edge in their perceptions. The third thing is that some in our American politics believe in the glorification of guns as a political tool and part of natural political rhetoric. There is a huge shame to be associated with those who knowingly or unknowingly incite the dim, the dull, and the mentally ill with rhetoric or visual imagery that has the potential of leading to horrendous acts. If anyone is so naive as to believe that putting a congresswoman’s image behind cross hairs of a rifle sight in advertising is not incendiary rhetoric, they should be ashamed of their stupidity and should never to be trusted with power in the American political system. And so, what does this have to do with the hands? Everything. The use of the hands in creative acts is THE most healing and therapeutic human activity. When the hands are not engaged in the making and use of creative tools, they may be drawn to explore more destructive behaviors using various forms of weaponry and violence. Some will say that the problem in Arizona has something to do with the availability of guns. I partially agree. They should not be allowed in the hands of the criminally insane, or in the hands of those suspected of being so. But it has been said that idle hands are the devil’s workshop, and if there is devilry afoot in the actions of an evil assassin, one must wonder, "could he not have been given something more rewarding and creative to occupy his attentions?" The hands have a way of making whole. They fix, they make, they create and they serve. they plant, tend, nourish and protect. And the great shame of our American culture is that we have deprived hands of their dignity and greatest purpose, that of restoring and balancing our souls. Make, Fix, Create, Tend, Nourish, Heal. 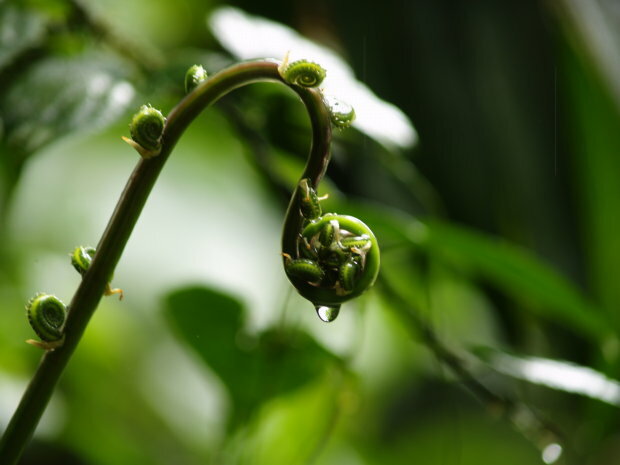 Pura Vida is the Costa Rican national motto which means pure life. It also means something gentle that is too often lacking in the US. From the earliest days of the manual arts in schooling there have been misunderstandings of its value and usefulness in shaping the intelligence and character of all students. Many scholars held the position that hands-on learning was unnecessary for those of their kind. Working with the hands was messy and degrading, something that was to be avoided, escaped if possible. Educational sloyd, on the other hand, recognized the relationship between the hands and the development of intellect, and also promoted an understanding of the relationship between crafts and the development of character. I propose a third value, that of the relationship between the crafts and scientific intelligence which I have described here many times before. You cannot whittle a stick without becoming an intense observer of the qualities inherent in the material. So it is with all craft operations, and with the teacher’s invitation to witness the science that unfolds in our own hands, students can become lifetime observers of scientific reality. And so it is, that by dividing our students into two classes, academic and technical, college prep and not, we cut them short at both ends. I have been reading an interesting book about wood by Harvey Green, Wood: Craft, Culture, History. It describes how we took trees for granted, but then awakened to their value as we marched ever closer to their destruction. Perhaps it will be the same with our hands. We are perched at that point that those making and selling digital input devices propose that we escape them entirely. The fingers themselves and the awkwardness of learning to control them may lead us to self-tying shoes and automated nose pickers. Of course, my very simple point is an invitation. Pay attention. Just as programs can track your every keystroke on the computer, to save your work from disaster, attention to the workings of our own hands are an enrichment. As described by Anaxagoras, Man is the wisest of all animals because he has hands. Nothing new there except what we have ignored or forgotten. DIY, Make, fix, create. 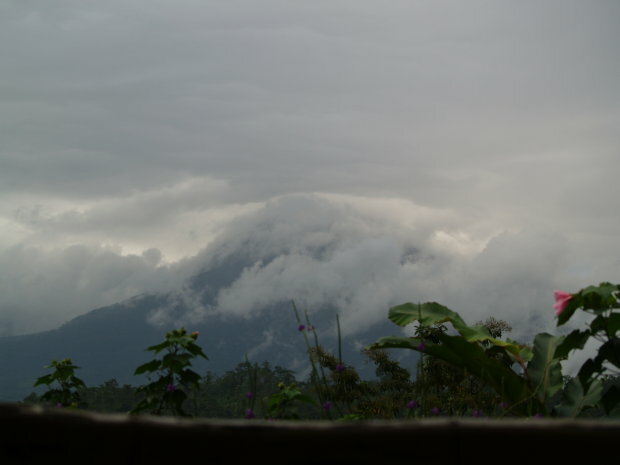 My wife, daughter and I are in a friend's home perched on a mountainside near Matapalo in Costa Rica. We have a view of the ocean a great distance at the front, and the jungle up to the back door behind. I may go into a sort of making withdrawal after a few days of this. I need the world more actively at hand, but am living the life of wealthy gringo for a few days, but of course this life for me is a pretense. Things cost more than one might think and I will have to go home and work hard to catch up. I am reminded of the tools we give kids. How about plastic saws and hammers that allow them to play Bob the Builder, when we could give them real capacities. When my daughter asked if she could do wood carving in my shop, I thought at first of giving her my old carving chisels to use, but then realized that my better set would give better results, give her more satisfaction in their use, and be more likely to call for re-engagement at a later time. If I couldn't trust her in the use of my best tools, how are we to trust our children in the preservation of our planet? How we are training them in schools is an indication that we had best not. And yet, time marches like ants, and while the future is theirs, not ours what we do now has effects for generations. There is a relentless quality to the natural world. The waves on the beach come crashing in one after another. 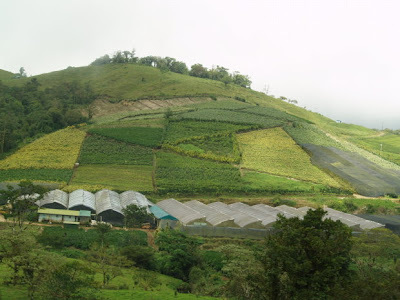 Here on the mountainside, the jungle vines are growing each day. Unattended, they would devour this small house. There is a plane flying overhead. It will land. 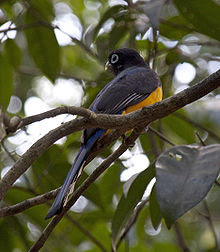 As a seemingly unrelated counterpoint, on a limb off the porch sits a black headed trogon like the one shown in the photo above. We stand still and stare eye to eye, with my binoculars forming circles around my eyes that match the circles I see around his. The moment is surreal, past in a flash and timeless. One of the most important things about travel is stepping outside the comfort zone, and for kids, it can be essential. How do we create schools that provide both a sense of security for learning and provide a means for kids to step beyond themselves? We are preparing them for a future which we cannot know. There are days in which I should refrain from posting in the blog. There are days when I'm processing what I have seen, heard and experienced. A few days traveling in Costa Rica have put me in that state. If you are uncomfortable with the challenges of engaging your hands in learning, (as some might reasonably be) there is nothing to it but to do it. Yesterday I had the chance to milk a cow, and I stood by shy. I watched my own comfort zone interfere with a simple thing that I now regret. The most challenging part of hands on learning is that you probably won't be led there by statistics and research, but rather by your own inclinations. Step our of the comfort zone. Make, fix, create. Milk a cow and have no regrets. John Grossbohlin sent a link to an article in the New York Times about a turn-around in attitudes toward play. Parents are realizing that playing computer games does nothing for children's creativity. In fact, placing children constantly in the comfort zone of screen-time and game controllers is far more incidious. They say "playing" computer games. But they are nothing like being in he real outdoors. Baseball, anyone? And did you know that all major league baseballs are hand sewn in San Juan, Costa Rica? The article in the New York Times can be found here: Effort to Restore Children's Play Gains Momentum.